Mexico is unlike many other places on earth, in that it is globally recognized as a Vavilov Center, a center of crop evolution and origin. Some of the foods the entire world enjoys came from the fertile Tehuacan Valley or other rich agricultural fields in this country. If GMO were allowed to ravage these age-old crops, some of the world’s food heritage would be robbed from us all. It is due to the peculiarity of this region of the world that experts are now flocking to support a non-GMO agricultural paradigm. Mexico’s agricultural biodiversity is beyond rich. It isn’t just the non-GMO corn tortilla we would lose by allowing biotech to get its hands on the land there. Plant scientists have discovered more than 60 varieties of maize in Mexico – the equivalent of a natural genetic treasure chest, which could be completely spoiled if companies like Monsanto, Dow Chemical, Dupont, Syngenta, etc. were to get their grubby little hands on Mexico’s agricultural real estate. Even extreme weather situations could be aided by so many types of maize crops, since they thrive in various conditions – from wet to dry, hot or cold. 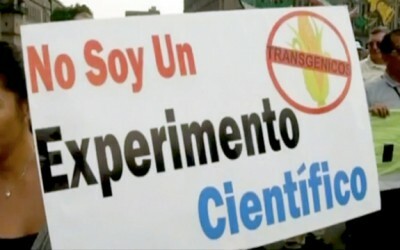 It is due to Mexico’s agricultural biodiversity that many experts are now coming together to help inform a general public that is still very much ignorant about genetically modified foods in their area. Mexico’s agricultural history and genetic biodiversity hang in the balance. Other than some media attention in 2013 during a court battle to ban GM maize, swiftly passed by a Mexican judge who believed the cultivation of a GM crop was a threat to farming heritage and ecosystem viability, the masses are still largely unaware of many issues surrounding GMO. Read: Brazil Rejects GMO Corn! “There is no position of the Mexican people in general regarding GM foods, as the government, violating the constitutional right of the people to healthy food, has not provided information about the risks of these GMO products, which are not even labeled. GM companies are hoping that general public support (through ignorance they help to perpetuate) of their poison crops will help push them through legislation in Mexico. Both biotech and branches of the government are still in support of GMO even though these crops could completely kill off an innumerable amount of biodiversity in the country. The government and biotech look at possible profits while ignoring the long term effects of these crops. With enough people realizing that protection of their agricultural history is equivalent to protecting thousands of years of cultural richness – from the Mayans who recognize maize as a staple crop with stories of Popul Vuh, to the discovery and opening of Maize Mountain, a place were maize seeds were hidden and protected according to Mayan legend, GMO could be defeated. Luckily, a group of 53 scientists and 22 civil organizations called Acción Colectiva will draw on this rich cultural heritage, combined with sound scientific data to describe the imminent risk and harm to the environment if genetically modified crops are allowed in Mexico. Monsanto’s Chief Technology Officer, Robert Fraley, expects to end a suspension of the cultivation of GM maize in Mexico, but he won’t see it with enough education and activism, which could ignite Mexicans to oust these companies’ influence from their rich agricultural practices. Thank goodness Mexico may be one of the few places with corn variety that is NON-GMO !!! Watch “The Future of Food” explains about Mexico’s unique corn crops. Right On great move on Mexico’s part. Now if we could just make headway in the USA! Watch a movie called “The world according to Monsanto.” GMO corn had been found in Mexico. It’s so sad that we have to fight to keep our food natural. So sad…thank you I figured that may have happened by now, I’m going on radio in my local area as there is little understanding here of the dangers of GMO – if you ever have info feel free to send it. I am on a mission to inform people of the dangers. When you combine the chemical assault on humanity through chem trails vaccines and gmo’s we are bathed in chemical/genetic/nanoparticles/heavy metal soup and it is making us all sick in varying degrees. Bioaccumulation and amplification all come into play. “Origination”? Please! The word is “origin”!